PEWATRON: Break-through performance from a new generation of precision Hall Effect Current Transducer through the selection of state-of-the-art materials. Both the calibrated and un-calibrated versions offer excellent linearity and thermal stability without compromising size. The calibrated version has negligible hysteresis. These features allow currents from fractions of an amp to 45 or 60 amps to be accurately measured. Additionally, an insulated housing provides an AC test voltage rating of 4kV. The housing can include between one and five primary conductors to further increase the sensitivity in steps if desired. 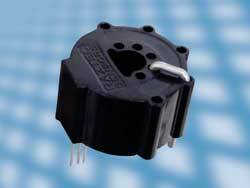 The RAZCi versions include extended supply voltage of 3V to 5.5V. Typical applications include motor control or where a fast and accurate current sensor is needed. The sensor’s excellent low current performance resulting from minimal hysteresis effects makes the sensor very appropriate for battery current monitoring. PEWATRON specialises in physical and geometrical sensors, power supplies and e-components. PEWATRON delivers a wide assortment of electronic components ranging from standard products, modified standard products or customised solutions. PEWATRON works closely with developers and can be involved right from the start of a product development process to ensure that together with the customer, the best fitting component for the application is found. PEWATRON, an independent company that belongs to the Angst+Pfister Group, has been serving customers in Europe with prompt and individual service for over 30 years. Through the Angst+Pfister Group, PEWATRON belongs to a world-wide network of over 1000 employees and 60 000 satisfied customers.